The historic DIY theater company Bread and Puppet brings its most famous play, Fire, an avant-garde anti-war meditation to Omni Commons. Courtesy Bread and Puppet Theater. A production of Fire by Bread and Puppet Theater. Fire will be performed at Omni Commons (4799 Shattuck Ave., Oakland) on Oct. 6 at 7 p.m. $10 suggested donation. BreadandPuppet.org. Bread and Puppet Theater is known for its elaborate outdoor pageants in which up to hundreds of performers and volunteers work together to manipulate massive, papier mâché puppets as they proceed through the streets or around a field. The puppets and their puppeteers yield political messages, often rallying against injustice. Oversized masks loom, and huge arms extend over protest crowds or other audiences, offering both comfort and a call to action. 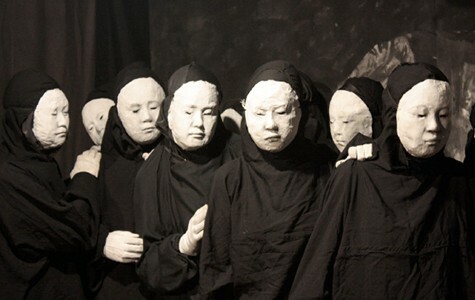 Bread and Puppet began in the early Sixties when Peter Schumann, a sculptor, dancer, and baker who had recently emigrated from Germany, began putting on productions with fellow theater experimentalists in a small loft on Delancey Street in New York City's Lower Eastside. Schumann converted the space into a puppet theater and museum, fusing all his interests by putting on plays that used his sculpted puppets and masks as characters and costumes and serving freshly baked bread during the shows. He and his wife, Elka, officially named the company Bread and Puppet in 1963. From the beginning, Bread and Puppet was a platform for political digestion and protest, most famously involved in the anti-Vietnam War movement. In 1968, the company presented Fire, a spare and quiet piece — unlike most of its usual productions — at the esteemed Nancy Theatre Festival in France. The speechless play took the audience through seven days in a Vietnamese village that, over the course of the production, is gradually ravaged by war. The poignant, understated show aligned with trends in avant-garde performance at the time, inspired in part by John Cage, Merce Cunningham, the fluxus artists, the Judson Dance Theater, and others. Fire accrued wide critical acclaim and jumpstarted a historic career for Schumann and his ever-evolving DIY theater company for which he still hand-sculpts every fantastic puppet and mask. Bread and Puppet celebrated its fiftieth anniversary not long ago. Since 1970, it's been housed on a farm in Glover, Vermont, where the barn doubles as a museum and a space to develop productions between tours. After a fourteen-year hiatus from the West Coast, Schumann and his company will be traveling to California for a tour packed with programming, including a performance of Fire at Omni Commons (4799 Shattuck Ave., Oakland) on October 6, at 7 p.m.
Fire is a slow and contemplative piece dedicated to Americans who set themselves on fire in protest of the Vietnam War in the Sixties. It begins with a cantastoria — a type of storytelling that involves painted scenes and choral singing — to preface the setting. 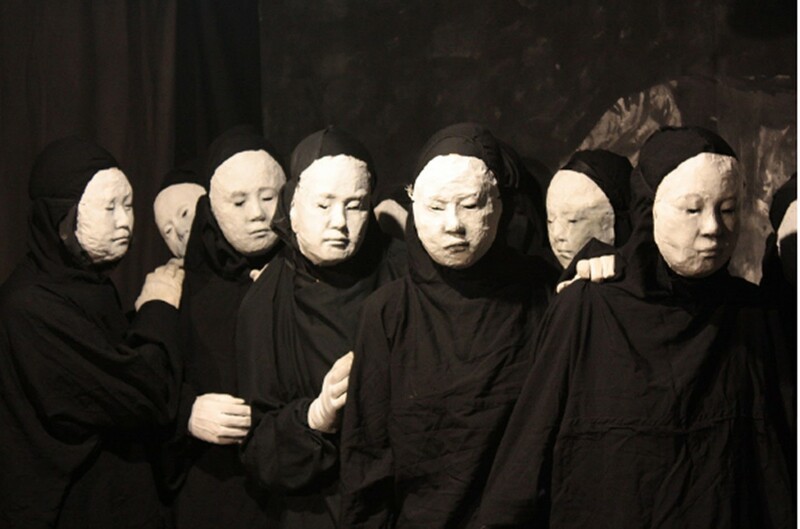 Every actor is identically dressed, fully draped in black cloth with a simple, white mask over his or her face. They crowd onto the stage, where the village they live in and the elements of their everyday lives are represented by a few spare props — a naked light bulb, a soup bowl, a book. There's no musical soundtrack — only simple, live sound effects that, along with the intricately designed lighting, become characters of their own. Each movement in the nearly hour-long performance is deliberately orchestrated, dismissing realism for gestural allegory, as each movement poetically builds up to the devastating climax, filled with flames. Through the show's solemn simplicity, Schumann confronts the ways in which war can gradually dismantle the life of a person, and of an entire village, forming a profound anti-war argument without any speeches or finger-pointing — just sorrow and empathy. In a recent interview, Clare Dolan, a longtime Bread and Puppet performer and member of the West Coast tour troupe, explained that the piece was revived last summer in response to distressing events in Gaza. "I think that when we talk about drone strikes, and we talk about Afghanistan, and we talk about Syria, and we talk about all the ways in which we're implicated in violence in the world," said Dolan, "I think it continues to remain or feel very relevant to us." Along with Bread and Puppet's Oakland event, the company will also be doing many appearances in San Francisco. Among them is an event on October 9 that will celebrate the adoption of filmmaker DeeDee Halleck's 150 hours of footage of Bread and Puppet performances into the Internet Archive to be preserved for public accessibility. The event will include bread and wine receptions, an art sale, a solo performance by Schumann, and a performance of Fire. The next day, company members invite the public to join them in a parade performance called We Are All in the Same Boat at Dolores Park. Participants are asked to wear all white, and show up at 1 p.m. for an hour of rehearsal before the procession begins at 2 p.m. Considering recent cultural clashes in the Mission District that's home to Dolores Park, Bread and Puppet's light-hearted romp will be underscored by a serious call for residents to recognize a broader sense of community and accountability.